Janet on Closing The Loop! Joe Thur on Closing The Loop! Cygnus Crew on Closing The Loop! Bruce Atkinson on Closing The Loop! Cygnus is a northern constellation lying on the plane of the Milky Way, deriving its name from the Latinized ancient Greek word κύκνος (kyknos) for swan. The Northern Cross, one of the most recognizable groups of stars of the northern summer, is in the constellation Cygnus. In April of 2013, shortly after receiving her new name, our Cygnus was accompanied by two flying swans on the Connecticut River, on the first leg of her journey to her new home in Maine. Cygnus was among the 48 constellations listed by the 2nd century astronomer Ptolemy, and it remains one of the 88 modern constellations. Cygnus contains Deneb, one of the brightest stars in the night sky. 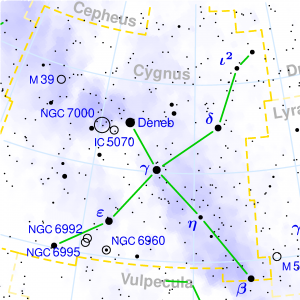 Deneb is one of three stars in the Summer Triangle, along with Altair and Vega, the brightest stars in the constellations of Aquila and Lyra, respectively. Used extensively for navigation prior to GPS, the Summer Triangle lies virtually overhead at midnight at mid-northern latitudes during the summer months. Albireo is the fifth brightest star in the constellation Cygnus. Albireo appears to the naked eye to be a single star but through a telescope, even low magnification views resolve it into a double star. Cygnus X-1 is a well-known black hole and galactic X-ray source in the constellation Cygnus. It was discovered in 1964 during a rocket flight and is one of the strongest X-ray sources seen from Earth. Cygnus X-1 was the first X-ray source widely accepted to be a black hole candidate and it remains among the most studied astronomical objects in its class. Cygnus X-1 The Voyage is the last song on Rush’s album A Farewell to Kings, and the second part, Book II: Hemispheres, is the first song on the following album Hemispheres.